Nothing like gratuitous use of the word "landfill" to remind you that your garbage doesn't just go "away," it goes to THE LANDFILL. Austin has a carshare fleet of Smart cars, but these carshare cars were electric and plug-in hybrids with their own dedicated parking spaces and chargers (like we saw on our Leaf tour). Moving along...it was lunchtime, so we ducked into a little bar/restaurant, Absinthe, which turned out to be pretty awesome. We ate at the bar, which was copper, and there was an amazing assortment of liquor bottles lined up against the windows across from us. My favorite part was the citron pressé, which was a DIY project consisting of a glass of ice, a small carafe of water, a little glass of simple syrup, and a little glass of two parts lemon juice and one part lime juice. Delicious. Just like my favorite summer beverage. 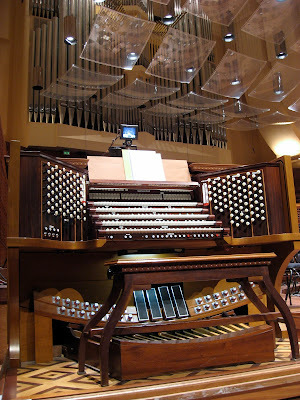 There are A LOT of buttons and pedals on an organ, so a lot goes into playing it competently. San Francisco has the largest organ in the Americas -- 8,000 pipes! The hall was recently remodeled and is gorgeous, with glass baffles hanging from the ceiling that give it modern style without detracting from its traditional grandeur. Between the organist, a piano soloist, and the orchestra themselves, the performance was outstanding, and we had a special treat when the conductor and the pianist stuck around for some really interesting (and funny) Q&A afterward. After the symphony, we walked through Japantown (where I bought an umbrella with bunnies on it) and then had pizza with our friend Becky (who rode the wave of friends-leaving-Austin a couple of years ago). Although we took the bus back to the hotel after dinner, I probably walked five miles that day -- and loved all of it. Apparently there's an ordinance that all construction in the city (or some central area that seems to be pretty broad) has to be adobe. 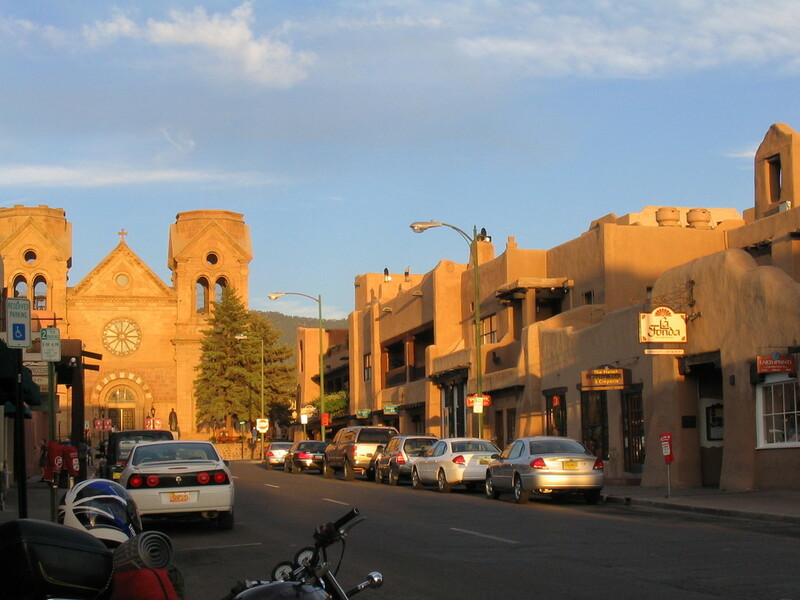 It makes for a really unique town, quaint in its own special way. It's called a "Trombe wall," named after Felix Trombe, who developed the concept for use in modern homes. It ain't pretty, but covering a thick stone/brick wall with glass (with a small air space in between) allows heat to build up in the wall and radiate into the structure over a period of several hours to keep the house warm throughout the evening (Margie's house has small wood-burning stoves, but no central heat). Because heat radiating into your house through the walls is exactly what you don't want during the summer, Trombe walls are generally built with an overhang that shields the summer sun (which travels higher in the sky) but allows the lower winter sun to work its magic on the glass; appropriately placed deciduous bushes/trees can also be effective in blocking the summer sun but allowing the sun through the branches to the wall during the winter. 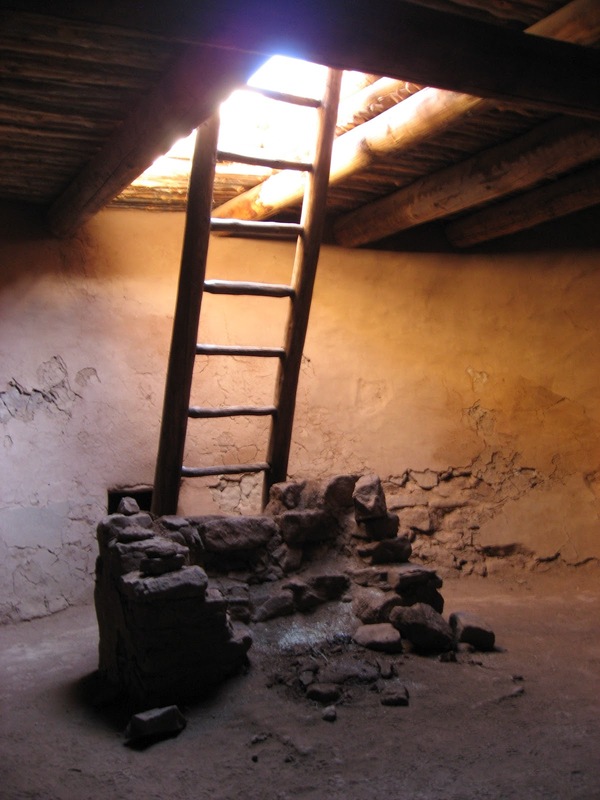 Adobe obviously predates the concept of green building, and Trombe walls date back to the 19th century (before Monsieur Trombe worked out the kinks in the 1960s), but the concept of using, essentially, dirt to defend against cold weather has been around for thousands of years. 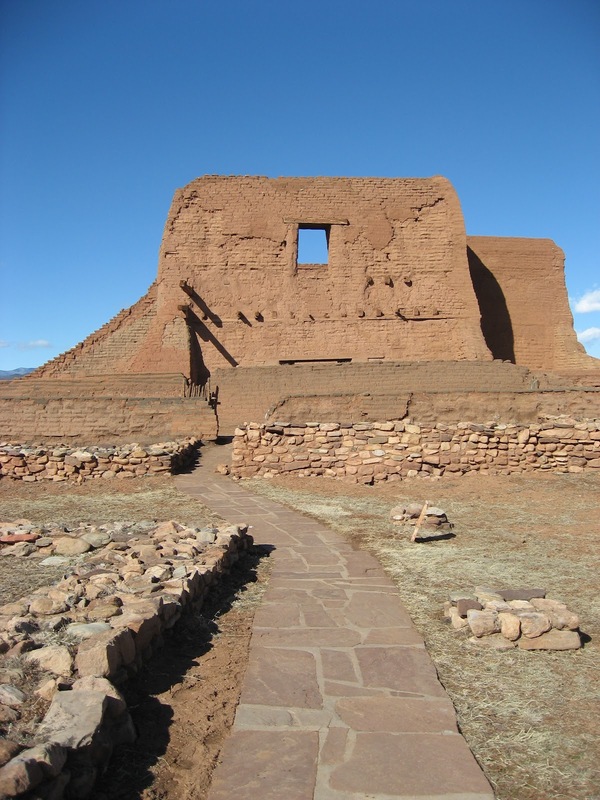 On the way to Angel Fire, we saw an example of that at Pecos National Historic Park, the site of Pecos Pueblo and Spanish Mission ruins. Those are the ruins of the 18th century Spanish mission church. 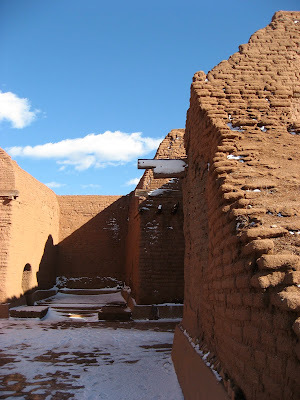 I don't know if this method of construction was technically adobe, but it was definitely made from what they had on hand -- red clay dirt, formed into bricks, stacked, and then covered over with a layer of...more red clay dirt. I'm not going to claim the former residents were exactly toasty during the cold winter months, but you know they were industrious and used the most insulating wall design possible. Yeah, those walls were THICK. This is an underground area (don't remember what it's called) where the people would go for various rituals. This? Not historic at all. It's the back porch area of the Visitor Center. I just thought it looked cool. We probably saw a thousand of them within about half an hour. And they're HUGE. Yeah, those are cars on the road. And a train. And the windmills tower over them. We estimated that the base of each windmill is probably 8-10 feet across. Truthfully, I don't know much about wind power. One of the builders we talked with tried to talk us into a (much smaller) wind turbine in our backyard, but it didn't seem to be cost-effective, so we didn't really explore it. I don't know how much wind it takes to operate them (I don't think Austin gets enough...but I could be wrong). I don't know if you can buy, for instance, 6 kilowatts of windmills (like we contracted for six kw of solar panels). I don't even know how a turning windmill actually generates electricity (although I am reminded of making electromagnets in junior high science class), or how these thousands of windmills are tied into the local (or regional, or statewide?) grid. Pretty much the only thing I know is that they are transforming the landscape not only of northwest Texas (where wind is pretty much a constant) but also of power generation in Texas. On our way back from Angel Fire, we discovered that there is a windmill museum, the American Wind Power Center and Museum, in Lubbock. We had wanted to stop in and check it out, but our desire to just get home won out. Next time. Interested in learning more about wind power? Or about how the ocean can help to generate electricity? Click here for the scoop on a wind farm project slated for the coast off of Cape Cod. Steve was in charge of planning the trip, and upon the suggestion of a co-worker, he chose Angel Fire (not far from Taos). It's a smaller resort in a small town, without many of the amenities of major resorts, but the upside was that it was shockingly affordable. We stayed at the resort lodge for something like $70/night, and since we were staying at the lodge, we got half-price lift tickets. At a time when some resorts are charging well over $100/day to ski, the $32 we paid was a steal. The first day we were there, Steve went snowboarding on his own. I walked him out to the lift and took a picture of him. You know, like it was his first day of school. We both took the second day off (since we drove, we weren't constrained in what we could pack, so we had lots of books) and then spent the last three skiing on a really relaxed schedule. Staying up at the resort made it easy to wake up whenever we wanted to (um, late) and then mozey out to the slopes. I even managed to find a few little jumps that were pretty fun. Did I land it? Yes, yes I did. Oh, perhaps you noticed our new helmets? We've never used them before, but we decided this was the year to go ahead and make a modest investment in the most valuable assets we have: our noggins. (I think we spent about $100 for the two of them.) I would estimate that about half of the skiers/boarders were using them, and I think it's only a matter of time before not wearing a helmet will be as shocking on the slopes as it is on a bicycle. In fact, during our trip we heard about two or three skiers dying of head trauma at other resorts, so it was an easy decision. And they're comfortable and kept our ears nice and toasty, so it was no imposition on our ski comfort. The only thing was that mine left a tiny gap between my goggles and my helmet (see the sliver of forehead in the picture? ), and my head got a little chilly. Steve's was a perfect fit, though. 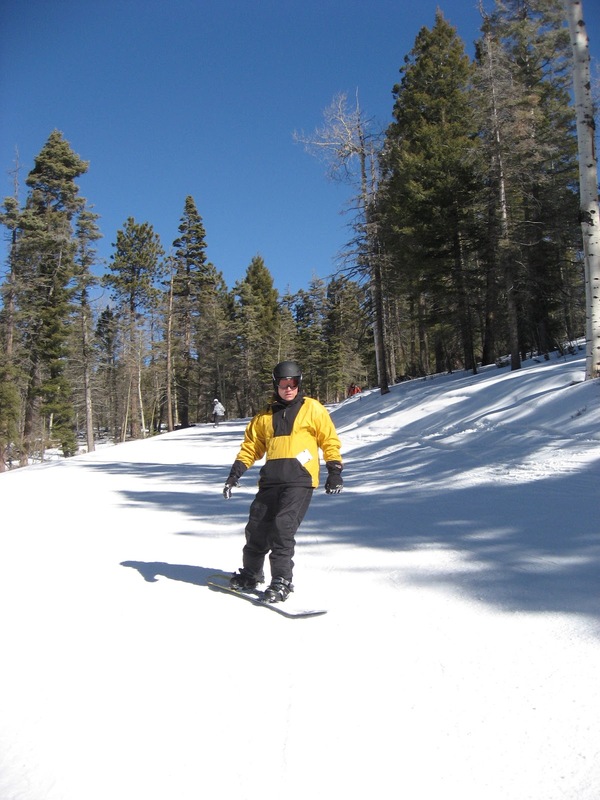 I'd love to say that New Mexico skiing was totally inferior to Colorado skiing, but in reality it was very comparable to the best resorts I've been to (although there were a lot of areas of branches and even some rocks poking out of the ground due to the lack of snow this year). And the lift staff by far the friendliest I've ever seen -- they blew me away every time we rode up the lifts by asking whether we were having a good day, were enjoying the snow, etc. 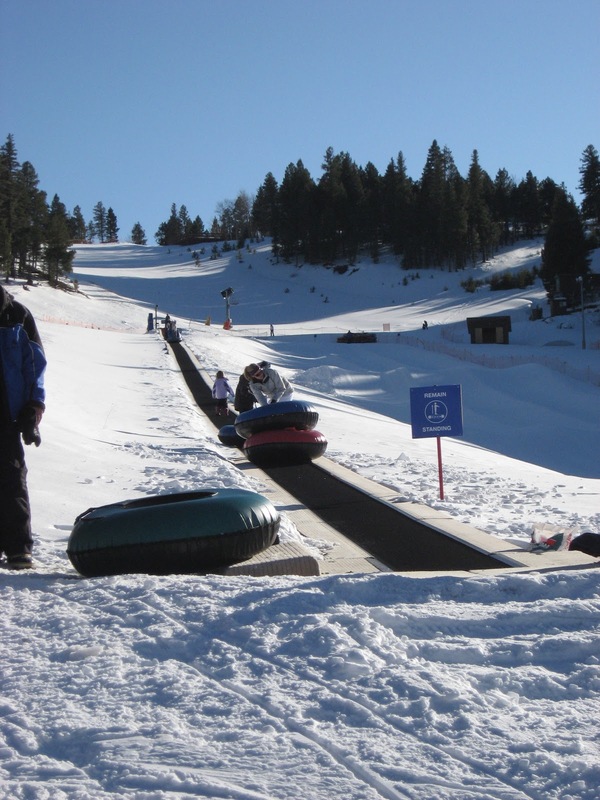 And the resort seemed to go out of their way to accommodate the miniature skiers, too, with lots of kids' lessons and even a tubing hill right there on the main mountain, with a moving walkway to bring the inner tubes back up to the top. It always tickles me to see the ski school groups looking like a mother duck and a bunch of ducklings. The only area where I could fault Angel Fire is in the food/lodging department. Our room was fine -- by no means fancy, but clean and modern enough, and definitely a great value -- but the only window opened out onto the indoor pool area, so we didn't get any natural light and couldn't even really keep the drapes open. Likewise, meal options were very limited, especially up at the mountain itself. Once we found The Coffee House, a little cafe on the first floor of the lodge, that became our go-to lunch spot. It would have been our choice for breakfast, too, but we had brought our own milk, cereal, and fruit. (Fortunately, the room had a mini-fridge.) Unfortunately, the cafe wasn't open for dinner, and none of the other restaurants in the lodge were too impressive. However, the resort owns a "country club" (I put that in quotes because I'm not sure if it's really a country club) a few miles away that has a fine dining restaurant, Elements, where we ate twice during our week. The first time we had a lovely dinner with one of the very best waiters ever. The dining room is a large, rustic space with huge beams and a massive yet cozy fireplace, and as we waited for our dessert, we decided that we wanted to finish our meal in front of the fire, which our waiter was happy to accommodate. All of the food was delicious, and piano music supplied by a very talented (and fun) pianist was the icing on the cake (er, souffle). It was an easy decision to return later in the week for "martini night," when we shared complimentary appetizers and ordered light entrees in the lounge area. 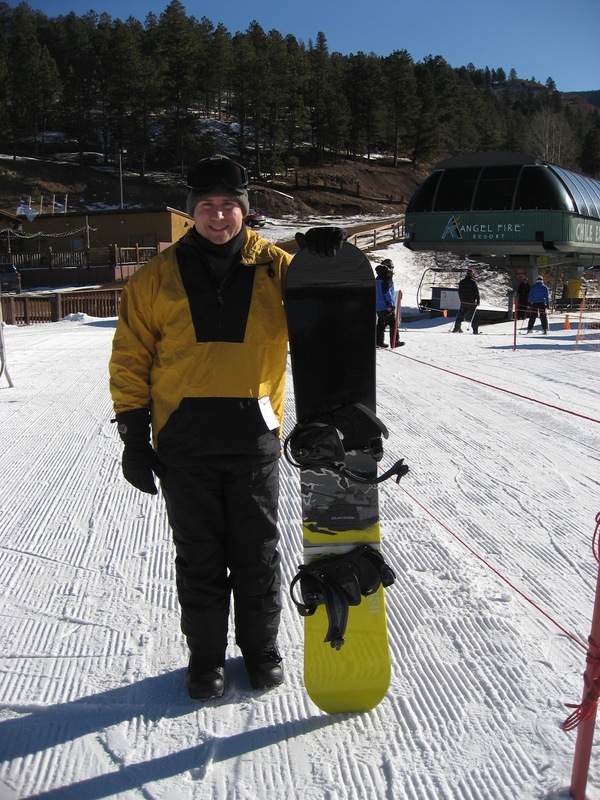 But back to the skiing, and to finish with something funny: Steve got a new snowboard before our trip to Crested Butte a few years ago. It was on clearance, it felt good, rides fine, and the yellow matches his jacket. It has this big "5150" across the bottom, and we didn't know what that meant until we looked it up and discovered that that's a reference to the second of California law that relates to putting someone on lockdown if they're a danger to themselves or others. (If I remember correctly, this law was used to get Britney Spears under control a few years ago.) So the implication is that Steve is a snowboarding lunatic, which couldn't be further from the truth. He is probably the most safety-conscious person I know, and while he takes more risks on a snowboard than, say, in his car on the highway, he's the last person who would need to be committed for excessively risky behavior. Over the next few days, I'll share more about our trip, including, of course, some neat green stuff that we had to leave Austin to find. A longer post is in the works once we have a chance to analyze the data further, but now for, the bottom line is that electric service cost us a whopping twelve cents in that first month. With long, sunny days in October and November, we actually had a surplus of 181 kilowatt-hours, which covered nearly all of our base customer charges for electric service. (Our total bill was more than that, since water, wastewater, garbage, and street service are all on the same bill, but the $80 or so that we would have spent on electricity was down to pocket change. Combined with our monthly $11 gas bill for our range, grill, and fireplace, that's not bad. Yesterday, after a big rain (and even some sleet! 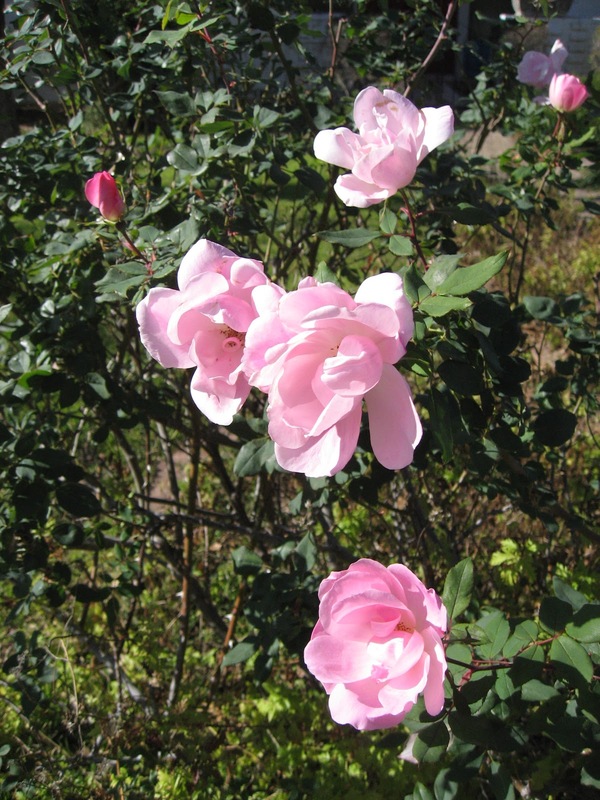 ), and just in time for Valentine's Day, every rose on the bush had turned to a sweet, soft pink. 1. 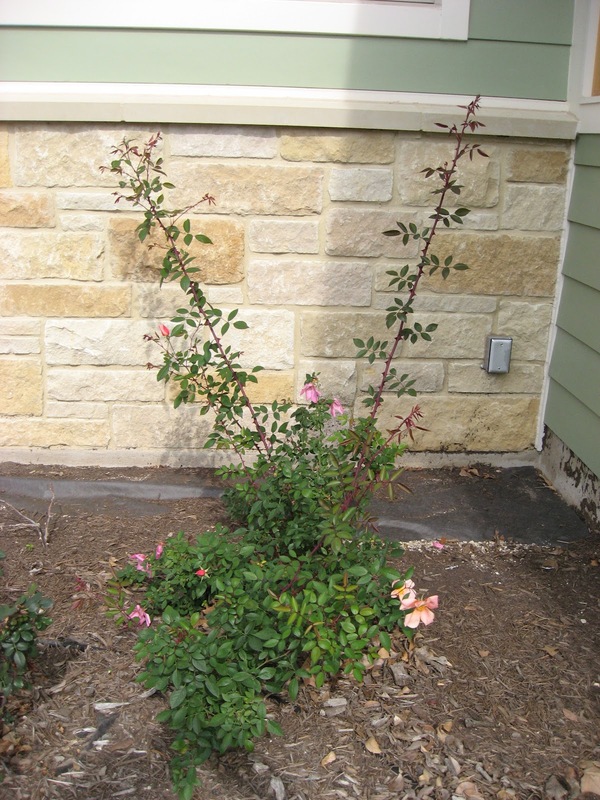 Are the pruning rules different for single-blooming roses (that only bloom once at the beginning of the season, instead of all summer long)? 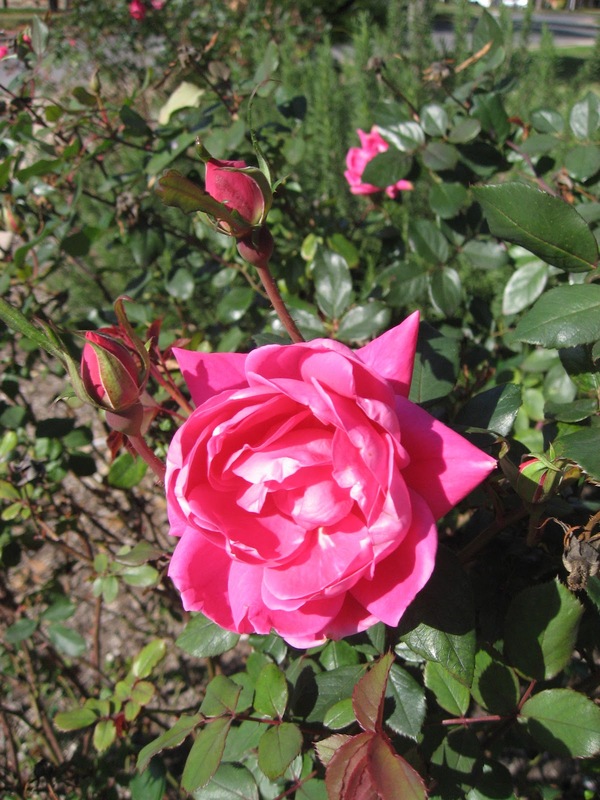 Answer: Yes -- pruning a single-bloomer now will make it a zero-bloomer. Good to know. We'll skip our single-blooming Sweet Briar rose and get into a habit of pruning it right after it blooms. 2. 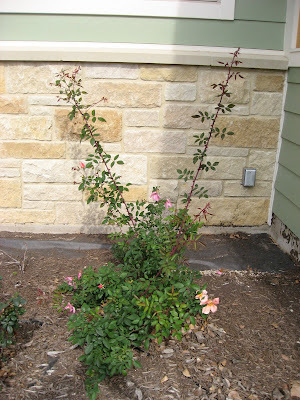 Should newly planted roses (less than a year old) be pruned? Answer: No. 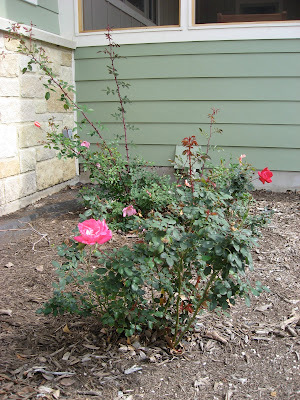 Okay, so we're exempt from all rose pruning this year. 3. Why aren't these cuttings rooting? (The question-asker showed the presenter a little pot where she had tried to plant a 3" cutting from a rose stem.) 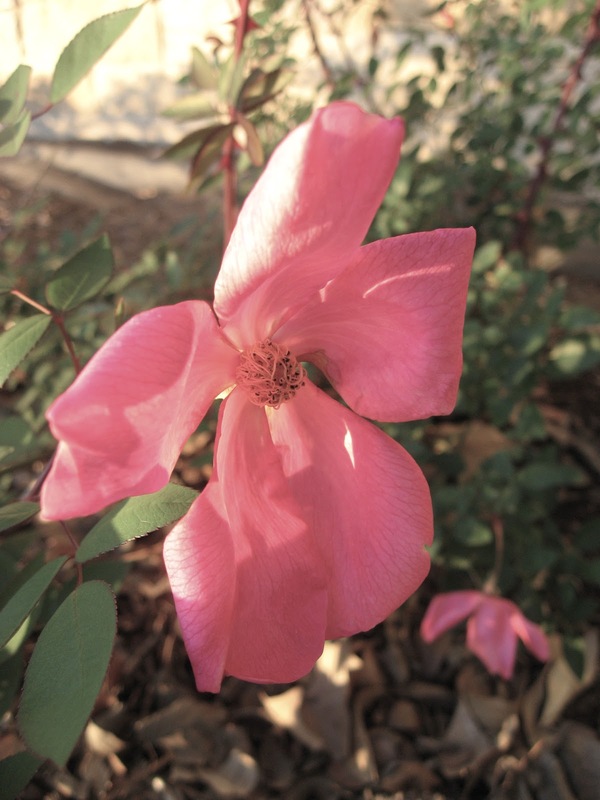 Answer: Because it was planted upside-down! So that sums up our recent rose adventures. But I can't resist adding this last picture. It's a sign that's posted at the Natural Gardener. Clearly I'm not a parent -- I didn't get it at first and thought it was a nice gesture to give lost children a beverage and a little plaything. Then it clicked.